If you have a lot to do and all is confined within 5 ft, this seat is great. As a rocker, it provides limited mobility. If you're going to be working thru an entire garden bed, you'll have to lift it and move around. For tasks like that, I prefer something w/ wheels but when I am working a small area, the Garden Rocker is very comfortable. I bought mine at a discount store for $13 w/o a seat. It is comfy enough w/o it but perhaps one day I'll make a cushion for it...not high on my to do list. I LOVE this thing!! I used to use a little step stool and would always end up having it sink in the ground. I found this thing when it was introduced and bought it. I can't live without it! It extends my reach and saves my knees and back a lot of potential pain. One thing I've noticed is the huge price spread on these. I paid $12.99 for mine but have seen them as high as $35! Check places like Tuesday Morning (I got mine at Meijer) before you spend more than $20 on it. Don't get me wrong, after having it, I would gladly pay $35 for it if that was the price, but since I'm a cheapskate, I want a better price! I tried using a stool but that was stationary and didn't exactly move with me as I was reaching to one side of me to grab a plant or reaching down in front of me to plant. I have a heavy duty metal version on wheels that incorporated a tractor seat into the design and it worked well enough but was too darn heavy to be practical. This particular Garden Rocker design is very light weight and you can pick it up and take it anywhere. It swivels nicely and you can rock side to side in it also. "The Garden Rocker, designed by Dianne and Sherry in collaboration with White Pine Concepts, is an ergonomic sitting support for use while gardening or doing other work down low. 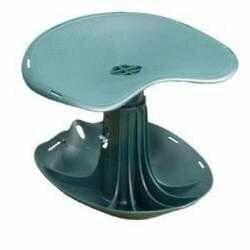 The patented shape of the base allows the person to lean forward, moving closer and lower to their work. It reduces strain and eases pressure on a gardener’s knees and back during prolonged weeding or planting. Your feet are able to be placed on either side of the base, offering versatility in its use. It allows you to turn from side to side, to move easily in any direction as it pivots on the curved base. The base also provides for convenient tool or weed storage. The shape of the seat is very comfortable and it is height-adjustable." There is an option tool caddy as well as a cushioned seat available for this garden rocker but I never saw the need to purchase either.